Due to the demolition and construction schedule implemented by the Los Angeles Unified School District for the construction of the South Region High School No. 15 project, a great number of changes are in the works here on the upper reservation of Fort MacArthur. For those of you who are not aware, the LAUSD has chosen to construct an 850 seat high school in the area located on the west side of the property. These changes are going to have an effect on many aspects of Old Fort MacArthur Days, possibly for as long as the next two years as the construction moves forward. We are asking all of our participants to exercise an extraordinary level of patience while we work to resolve some of the problems associated with the construction project, including the temporary loss of some of our most convenient parking spaces. We are working hard to find / make alternative parking arrangements that are as convenient as possible for our friends in the living history community as well as the general public who are coming to see the show. Parking Area B: This area should be used for parking by the General Public only. 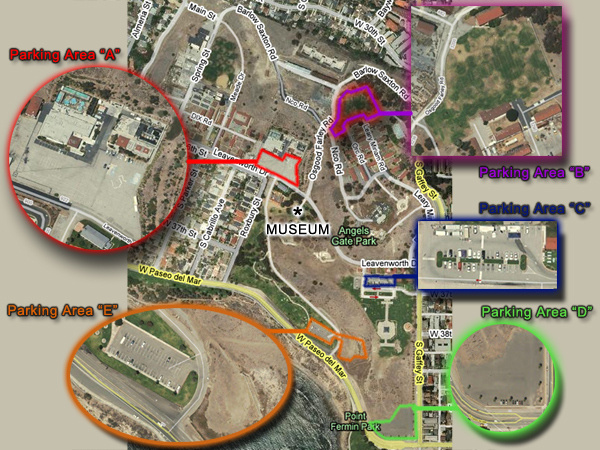 Parking Area C: Participant parking is encouraged in this area, it's a small parking lot so plan to get in early.